Many of us are aware of the negative energy in this world and how it can affect our physical body and space. The desire to shift the energy and increase the vibration of our homes, work space and bodies is finally being recognized as a path to inner peace and better health. In this workshop we will explore the fundamentals of space clearing. 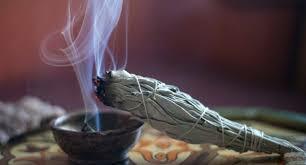 We will touch upon the basics, sage, crystals , sound and move further into ceremony, feng shui basics, mudras and more. You will learn how to raise your vibration and to create sacred space. Participants will receive a discount on space clearing tools in the Boutique!